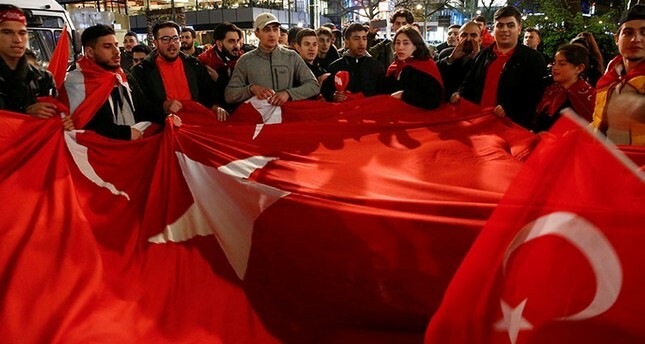 Regardless of a dogged European campaign, following some controversial bans on the "yes" bloc and overt support for the naysayers, Turks in Europe overwhelmingly voted "yes," in favor of the proposed constitutional amendments and transition to a presidential system. In Belgium, where voter turnout was above 53 percent, nearly 75 percent of voters opted for "yes." Belgium had been heavily criticized by Turkish officials and politicians for ignoring their calls for the extradition of terror convicts, and for allowing the PKK terrorist organization to hold rallies in Brussels, in order to put pressure on European officials and institutions during EU meetings. More than 46 percent of eligible voters took to the polls in Germany, which is home to some 3.5 million people of Turkish origin. The number of people casting their votes exceeded 660,000, far higher than the population of EU member state Luxembourg, and 63 percent of them favored "yes." Earlier in March, Justice Minister Bekir Bozdağ and Economy Minister Nihat Zeybekci were prevented from holding referendum meetings in Germany, while various towns and local administrations imposed similar bans on the "yes" campaign meetings, including those of the Union of European Turkish Democrats (UETD), which is registered in Germany. Meanwhile, "no" campaign meetings did not face any obstructions, with various German politicians and media outlets openly declaring their support to the "no" camp. Throughout the campaign, President Recep Tayyip Erdoğan and the ruling Justice and Development Party (AK Party) were criticized by European media outlets at an unprecedented rate, using derogatory rhetoric. This led to a bitter war of words between Turkish and German officials. Voter turnout figures were at almost 47 percent in the Netherlands, where the referendum campaign coincided with campaign for the Dutch general election, stained by anti-Islam and anti-migration rhetoric. An overwhelming 71 percent of some 118,000 voters in the Netherlands voted "yes." The referendum campaign had given way to a diplomatic spat between Turkey and the Netherlands when the latter prevented denied landing permission to Foreign Minister Mevlüt Çavuşoğlu's plane en route to Rotterdam for a referendum meeting on March 11. Later, Family and Social Policies Minister Fatma Betül Sayan Kaya was also barred from entering the Turkish consulate general in Rotterdam and deported to Germany. Dutch police then attacked Turks who were at the scene to meet Kaya and to protest the treatment of the minister. In Austria, where officials implemented an aggressive anti-Turkey rhetoric, 73 percent votes went for "yes," with a turnout rate of 48 percent. Turks in France also overwhelmingly voted "yes" with 65 percent of 142,000 voters (44 percent turnout rate) approved the constitutional reforms. The turnout rate in Denmark was considerably low at 33 percent, although 60 percent of some 11,000 votes cast their ballots for "yes." Meanwhile, Switzerland, Sweden and the U.K.'s sizeable Turkish expat community voted against the reforms with 62, 53 and 80 percent of the votes going to the "no" camp, respectively.